Nextar was a GPS manufacturer that marketed GPS devices globally. Several years ago, they stopped marketing to North America. If anyone has a Nextar GPS and needs a custom cradle, it’s going to be a real challenge to find. Especially for older GPS devices. So what should you do if you’re mount is broken and you still have affection for your Nextar GPS? That’s a good question. You likely found this article by searching on the terms ‘Nextar Mount’. So we’ll try to help with some suggestions for car and motorcycle mounts for a this GPS. There were a lot of different Nextar models. They were priced lower than mainstream competitors like Garmin and TomTom. When you purchased this GPS, you received the device along with a charger, custom cradle and a windshield suction cup mount. Nextar generally used two different types of mounting patterns for their custom cradles. For older models. that suction cup mount usually had four hooks on the back. It turns out that pattern can still be found on the market. The iGrip / Herbert Richter Extender Suction Mount has four hooks that match up with many of the old Nextar custom cradles. If your old mount had four small hooks on it, there’s a good chance this is the mount that you need. The mount has several adjustment points and you will likely find it better made than the ones that came with the GPS. The second type of mount that came with more recent models had a custom cradle with two slots on the back. Well, it turns out this mounting is also still available and very easy to find. A photo of a Nextar Q3 cradle and mount accompanies this article. 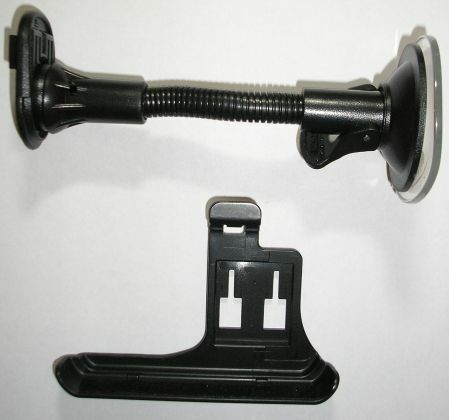 The Replacement Windshield Sticky Suction Mount has the dual T adapter needed to fit a Nextar custom cradle that has a dual slot pattern on the back. This mount has an adjustment point in the middle of the stem. There is a vacuum lock to ensure that the suction cup attaches firmly to your windshield. This mount has a dual purpose in that it can also attach to a textured dash. It’s a bit more difficult to a good motorcycle mount for an older Nextar GPS. We recommend using a good high quality motorcycle mount that would typically be used for a smartphone. Not all Nextar GPS devices will work well with this type of cradle. The back needs to be perfectly flat and the height should be no more than four inches. The Arkon RoadVise Handlebar Strap Mount. is an excellent mount with an expandable cradle that opens to 4 inches. As long as your Nextar GPS is no more than four inches in height and has a flat back, it should comfortably fit within the RoadVise holder. The sides of the grips are padded to prevent marring and opens to 4 inches. The included handlebar mount is constructed of plastic and fits bars up to almost 2 inches diameter. The ball and socket design allows full swivel for your device to be used in landscape or portrait mode. The mount is easy to install and remove. We always like to recommend adding a tether to any motorcycle mount, you can read about them here. We have a very detailed article on the Roadvise series available here. These three mount options should help you to keep your Nextar going strong for a few more years.